Chapter headings and selected papers: Preface. Acknowledgements. International Congress on Fracture: Officers. ICF8 Steering Committee. ICF8 Programme Committee. ICF8 National Organizing Committee. Mechanics and Criteria of Fracture. Deformation criteria in fracture mechanics of materials (V.V. Panasyuk). The science and engineering of fracture (J.F. Knott). Stress-Strain Analysis in Solids with Cracks. Smart computational fracture of materials and structures (H. Liebowitz et al.). Asymptotic equations for nonlinear strains in material interface corners and cracks (M. Scherzer). Fatigue: Physics and Mechanics of Fracture. Fracture and fatigue of sintered steel (B. Cotterell, Y.W. Mai). Effect of flaws on fatigue strength of cast materials (K. Morita et al.). Dynamic Fracture. Numerical simulation of dynamic fracture of concrete targets impacted by steel rods (E.P. Chen). Environmental Effects. Environmental assisted cracking in alloy 600 components in PWR primary water (P.M. Scott). Temperature Influence on Fracture. Influence of dwell at peak load on elevated temperature fatigue crack growth in Waspaloy (J. Byrne, R. Hall). Subcritical crack growth in polymer composite materials under creep (A.A. Kaminsky). Advanced and Special-purpose Materials: Physics and Mechanics of Fracture. Surface and sub-surface cracks under contact loads in transformation toughened ceramics (N.B. Thomsen, B.L. Karihaloo). Reliable plastic products through applying failure analysis and basic principles (J.L. Spoormaker). Engineering Applications of Fracture Mechanics. Safety and quality assessment of linepipes for gas transportation (A.N. Kumar). Towards damage tolerance of aging airframes (G.I. Nesterenko). Fracture Mechanics and the Strength of Welded Joints and Structures. Influence of hydrides on the strengths of Zircaloy-4 plate (J.B. Bai, D. François). Testing Techniques and Failure Diagnostics. Transferability of elastic-plastic fracture mechanics parameters to cracked components (K. Kussmaul et al.). Plenary Lecture. Problems of welding and strength of structures (B.E. Paton). The 8th International Conference on Fracture (ICF8), held in Kyiv, Ukraine, attracted 550 delegates from 30 countries with over 700 papers presented. This volume contains a representative selection of 72 articles of the highest standard from internationally renowned experts in the field. 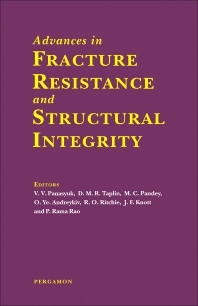 Principal topics covered include: mechanics and criteria of fracture, stress-strain analysis in solids with cracks, physics and mechanics of fracture, dynamic fracture, environmental effects, temperature influence on fracture, advanced and special-purpose materials engineering applications of fracture mechanics, fracture mechanics and strength of welded joints and structures, testing techniques and failure diagnostics. For anyone working in fracture mechanics and the performance of materials, this volume provides a valuable snapshot of the major recent developments in the field. For materials engineers and materials scientists.